Working in the dark, in today’s post. The problem and challenge with photography is actually light, usually there’s either entirely too much or not nearly enough.The reason you’ve all been subjected to so many shots of Subways entering and leaving stations in the last year has been that I’ve been experimenting with different techniques and camera settings down there, trying to find some sort of predictable formula which might govern my actions when shooting in the dark. The Subway system provides for a difficult to photograph set of conditions – it’s both dark and bright, full of reflective things zipping around, humans, and there’s LED signs which break up at anything slower than 160th of a second… Add to that the MTA prohibition against camera support – tripods and the like – and you’ve got yourself a real pickle. I’ve developed a few formulas for hand held low light photography down there. When you get above ground, the formulaic triad of iso/aperture/shutter offers some real potential. 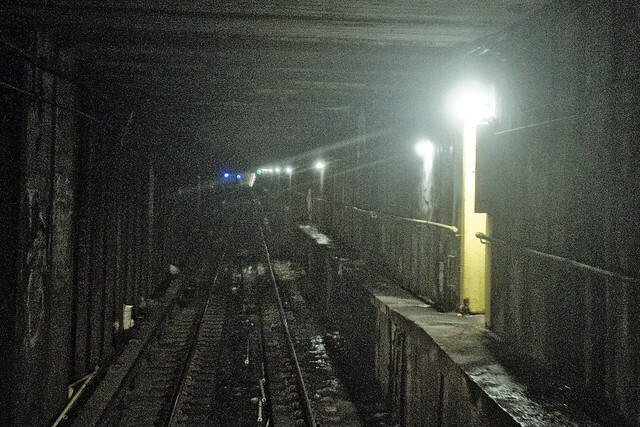 This is what it looks like deep under East New York, over in Brooklyn. This was also a serious “get the shot” challenge as the window of the C train I was on was caked with briny crap. The C is cool, because you can still look out the front window and see what the conductor sees as the subway shoots through the kingdoms of the rat. This shot, and the one below, were part of long chain of failed shots. 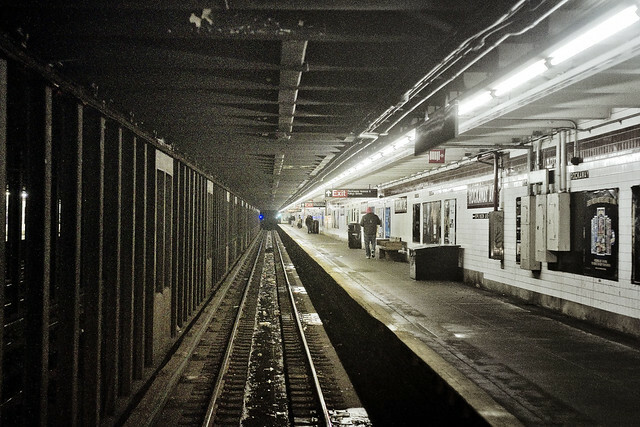 A high failure rate is assured, as the subway car is jiggling about and you are being jolted about in random directions. The camera is held against the window, with one hand used as a gasket between it and the actual lens. The difficulty, and high failure rate, are due to the great care exercised in not being bodily thrust forward which would either drive the camera through the window or render the lens inoperable. The shot above actually had what I call the “entire bag of photoshop hammers” thrown at it. Again, combatting the filthy train window, I pulled and pushed the pixels of the original digital negative file until I got some semblance of balance between dark and light. There’s something I like about the deep focus and the leading lines. Sort of like entering warp speed, which is something that the MTA isn’t exactly known for. 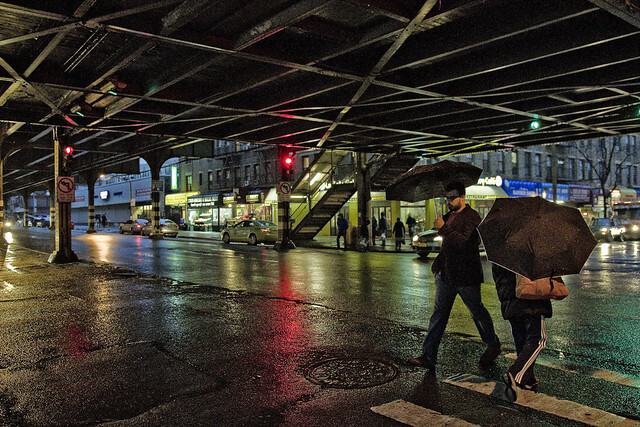 Another leading line “infinity” shot from the other night, captured in the preternatural darkness of Astoria’s 31st street. To make things even more complicated, it was raining, which meant that in addition to operating the camera I had to manage an umbrella as well. 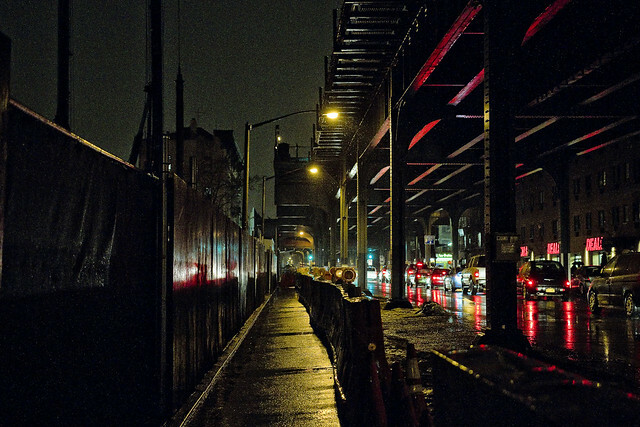 New York City never looks as good as it does when it’s raining, at night.